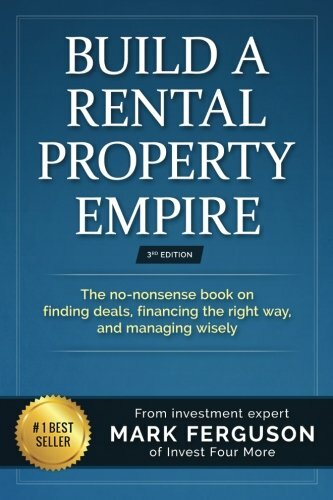 "I finally got a chance to purchase and read your book (Build a Rental Property Empire). It was easy to read and practical and pragmatic - and I liked it enough to give a copy to my son who is just starting out with his real estate investing and also to two of my investor clients as closing gifts." -Sharon Learn the best way to invest in rental properties in this 300 plus page book written by real estate investor Mark Ferguson (owns more than 100,000 sqft of rentals). This book gives you the exact details on how to finance, find, analyze, manage, and even sell rental properties. Where other books lack the details on how to actually make money in real estate, this book is all about the details. It is written by someone who has been investing in real estate for over 15 years and is still investing today. If you are having trouble figuring out how to find the right properties, how to finance them, where to buy properties, or how to buy with little cash, this books tells you how to overcome those obstacles. If you can't find your answer in the book, Mark even gives away his email address where you can ask him directly. Mark is a successful rental property owner, fix and flipper and real estate broker. Mark has sold over 1,000 houses as a broker, flipped over 155 houses, and owns his own office Blue Steel Real Estate. Mark bought his first rental property on his own in December 2010 and now has 19 rentals (commercial and residential). He has fix and flipped houses since 2001 and been a real estate agent since 2001 as well. Over the years, he has learned the best way to find rentals, get great deals, manage properties, finance properties, find great markets and build wealth with rentals. In this book, Mark gives you all the information you need to be a successful rental property investor. Mark also started Investfourmore.com, a real estate blog with over 35,000 subscribers and millions of visitors. He is known for his straight to the point writing that is easy to understand and full of insight. This book is not full of theories and made up stories. It contains real-world case studies and information on investing from an investor actively investing in today’s market (2017). Here are just a few of the topics covered: · Why rental properties will help you retire faster than other investments · The risks of investing in rentals · How to determine what a good rental property is · How to determine what type of rental to buy · How to get a great deal on properties · How to finance rentals, even if you have more than 4 or more than 10 · How to invest in rentals with less cash · How to repair and maintain properties · How to manage rentals or find a property manager · What are the best exit strategies · How to buy rental properties when your market is too expensive This book has been revised a number of times to reflect current market conditions and changes in Mark's strategy.